We first moved to our pleasant cul-de-sac house - great for raising kids - when our son, who's on the cusp of thirty-one, was four. One of the main reasons that we wanted it was that, apart from its location on the fringes of a historic market town in rural Hampshire, UK, it had a sizable conservatory looking onto the back garden. It was brown wood framed and had a corrugated transparent roof sloping down from downstairs ceiling height. On the face of it, it doesn't sound that glamourous, but we loved the idea of a conservatory. Luxury! I even liked the red brick walls which it was built against - the original exterior of the house - and the light brown varnished wooden floor. So, we outfitted it with all the necessities that make a conservatory the space it's meant to be. Garden chairs for lounging in, a small table for your drink and various plants. It looked good. Then I decided I could incorporate the art studio I'd always wanted. We'd acquired the appropriate furnishings, including table, chest of drawers and shelving, and, me being an inveterate collector of antique curios, eclectic souvenirs and oddities of a theatrical nature, I decorated the space with much of that, plus the wild west artefacts I'd acquired over the years. So it became a fun space to create in, maybe except for perhaps fighting with a hanging plastic luminous Halloween skeleton to get to my table. At least, fun was the idea, and our son, who is himself a fan of the kind of surroundings I'd created, thought it fab! But depression (I was on antidepressants which really helped most of the time) got in the way of my enjoyment of the space. I never felt truly happy there and I felt disappointed about that. I'd read about artists working in their studios and loving it and being inspired by their space, and I was tremendously jealous of them. Plus the fact that they'd work there all day long. I couldn't do that - it would drive me crazy! I need variety of space and variety of activities. Hence my inability to become a professional, full time artist. As a result of this, I suppose, I was always too shy/embarrassed to call my space an art studio and Husband always took me to task over that. Unfortunately, because of thirty years of depression and my lack of domestic leanings, the house had become neglected, and my studio space even more so. Plus there was the problem of where to store all my creativity materials. All manner of 'stuff' was shoved wherever I could shove it. Then, five years ago over the Christmas period, I had a medication crisis on Prozac and I became suicidal. 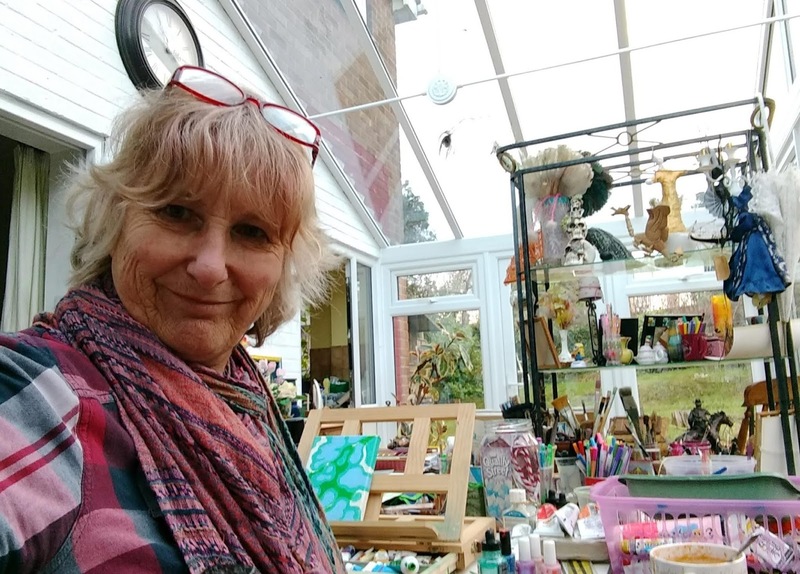 The short version of this story is that, through sheer luck and wonderful neighbours, we were introduced to the brilliant mental health team who literally cured me with a new prescription of antidepressants and Cognitive Behavioural Therapy. Over a period of three years and onwards, and making a major decision that would finally eradicate the depression, I became better than I'd ever been. A strange, novel, amazing feeling. Particularly waking up feeling good, and that becoming a consistent occurrence! 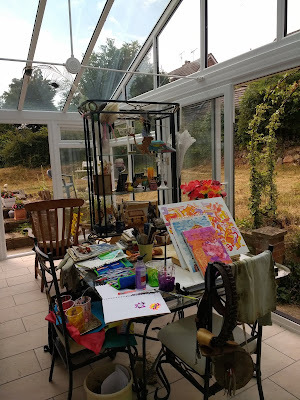 So we've been able to get to grips with areas of life that badly needed sorting, and do the things that we'd been unable to do because of my depression and Husband's work. One of those things was to redecorate the entire house. First the utility room (now looking fabulous!). Next, we knocked our bathroom and toilet into one. It's gorgeous now. Then - something we'd promised ourselves eventually - a brand new conservatory. Old one demolished, new one built. That happened last summer, and the result is fantabulous! The slowly rotting brown wood frame is kaput - gone. The corrugated transparent sloping roof, covered in pretty green moss so that no light could get in, has gone. All replaced by a beautifully light, bright, expansive space. I'd painted those red brick exterior walls bright white. The floor is now covered in warm, light brown textured tiles. The conservatory frame is white plastic, so no fear of it rotting and having to creosote it annually to prevent that. The roof is apex shaped against the house wall, giving us this amazing glass extension. We have new furniture to suit it. It's gorgeous. We were able to do all this because we'd been unable to do much before because of my depression and husband's work, and we're very good at saving money! I also came into an inheritance which meant we could afford to do it. Most of the items that had populated the old conservatory came back in, but some of the older, shabbier pieces were consigned to charity or the local tip for recycling. My old wooden desk, for example, rescued from dad-in-law's old office, had seen better days. We replaced that with a beautiful sizable glass and wrought iron table and accompanying shelving which we'd found in the charity shop, and which now houses my various collections and theatrical oddities. I still have to find places for other bits and pieces that husband would preferably like me to chuck! But, most important of all is that I'm using the glass table as a creative area, and I'm becoming happier working there. In fact, I'm beginning to enjoy it! I've never felt that way before. I'm working on making it a slightly less chaotic area, but I have my doubts about that. Organised chaos would be a good state to strive for. On the table I have a basket of acrylics and gouache paints, pots for pastels, coloured pencils and pens, charcoal, and more weird and wonderful oddments sitting among them. My art portfolios lie under the table, as do various sized sketchbooks. 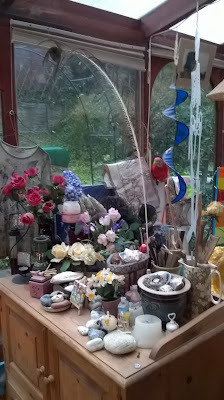 In the utility room behind me are more baskets containing collage, sculpture and 3D materials. When I'm sitting there I can look out onto our garden and see how that's coming along. It's a rather wild space, as expected, but we're slowly whipping it into submission. During the winter I use a heater in the conservatory and gaze through the glass up at the sky. As studio space, it is ideal. I have a ton of light and an excellent source of water, and a cleaning area in the utility room or the kitchen, off the conservatory. The kind of creative space that many an artist would kill for! I'm so lucky. All I've got to do now is actually use it, and enjoy it, and I'm certainly working on that! Hi, I'm a quirky creative, mental health advocate, traveller, wild west & ghost nut intrigued by science, a renaissance soul with a potty sense of humour. Five years ago I began a miraculous journey to full recovery from 30 years of depression. The catalyst was a medication crisis. A brilliant mental health team prescribed a medication, California Rocket Fuel (love it!) & Cognitive Behavioural Therapy. Now I'm better than I've ever been & I'm rebuilding my eclectic, adventurous creativity & life. I'm sharing my experiences to give other sufferers of depression hope.